These are INTERESTING stirrups. The pair weighs only one pound. They are VERY durable and remain so, even in low temperatures. We think you will have an "ahhhhh moment" as soon as you step into these stirrups. The treads have an integrated 3D swivel action on a shock absorbent layer. The treads have a substantial anti skid, glass fiber reinforced grip surface. The slender profile is designed for quick foot release during emergency. 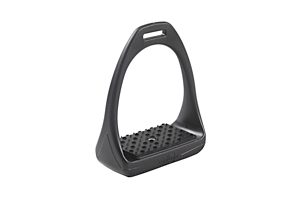 These stirrups are suited to beginner and expert riders. We feel they will quickly become a favorite in your tack room. SIZE: 4 1/2" wide, 2 1/2" deep.